WELCOME to the 33rd issue of BYMRr-Zine - a free quarterly newsletter published by Building Your Model Railroad, devoted to providing breaking news and tips to model railroaders of all ages and all scales in a quick and easy-to-read format. Resources are always credited where appropriate. If there are any particular subjects that you would like to see in the newsletter, please let us know at gjwarth@mac.com or gjwarth@building-your-model-railroad.com. Thank you for subscribing. 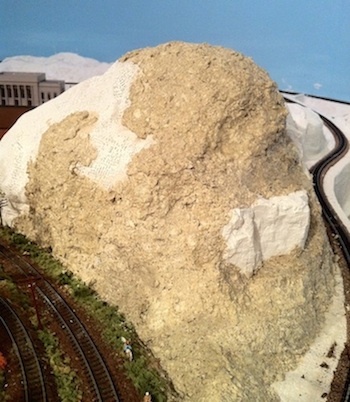 We have lots of new tips and tricks in this issue to add to your model railroading pleasure. And please tell your friends about us. 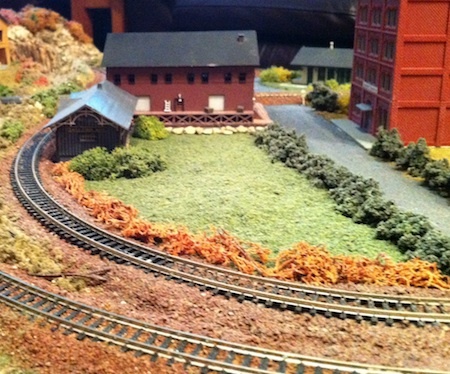 The more we can spread the word about model railroading, the better. Most of the manufactured track that we buy is made of plastic and stainless steel, which doesn't really look very realistic when it's installed on the layout. One way to improve the realism is to paint the track, either before or after laying it. I did mine after installation, but after reading the article in Model Railroader by Lou Sassi entitled "How to Paint and Weather Track (June, 2014, p30), I think it would have been much easier to paint the track before installing it. Lou's method was to spray paint the whole piece - track and ties alike - with Red Oxide Primer, though you could use a dark brown or gray color just as well. Then he brush-painted the rails with Floquil Rail Brown. This color unfortunately has been discontinued, but you could choose a similar color or perhaps use a rust color for the rails. Then paint the ties a gray-brown color to contrast with the rails. If you wish to enhance the wood grain appearance of the ties, brush on a 30% strength wash of India Ink (70% isopropyl alcohol and 30% India Ink). 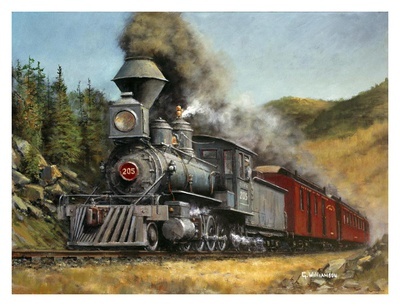 Make sure you wipe the tops of the rails off with a soft cloth containing paint thinner before you finish each section. After the track dries, you're ready to install it. See the BYMRR.com page on track installation for more details. Fusion Fiber is a product made by True Scene (http://www.truescene.com), that can serve as a scenery base for you on top of extruded foam, wood or Homasote. This can be a manufactured type of "ground goop" and basically used in the same way. When you're ready to make a scene, mix the Fusion Fiber as directed into several bowls. Add acrylic paint to each bowl to create the colored base that you want to use on different areas - like green for grassy areas, brown for dirt, gray for roads or parking lots. Then using a flat-blade scraper, "paint" your scene on the layout surface, using the different colors where you wish to create the scene. Then add ground foam, grass, bushes, weeds and other scenery items as you wish to make the scene even more realistic. The Fusion Fiber takes about 2 days to dry so you don't have to rush as you do with quick-drying plaster-products. If it does harden a little, you can just spray it with warm water to soften it up. Once it's dry, it tends to be very durable. 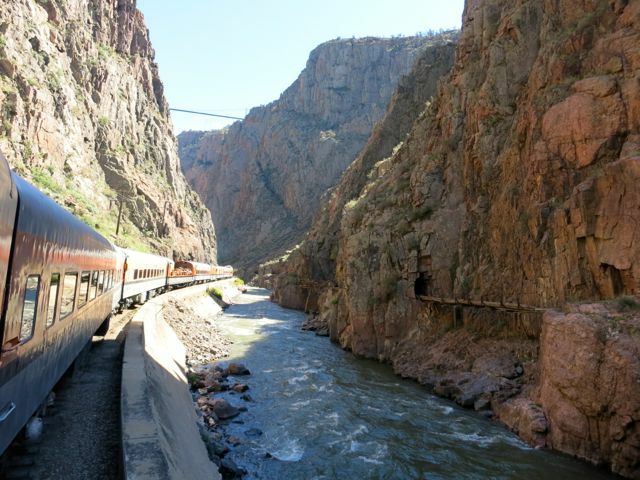 While I was in Colorado, I couldn’t leave without visiting and riding on the Royal Gorge. Unfortunately, most of the actual Royal Gorge Park had been recently destroyed by fire so we couldn’t get close to the Royal Gorge Bridge except by telephoto lens. The bridge itself is still standing and appears to be in relatively good shape. The park and visitor center is being rebuilt and should be ready to tour by next year. 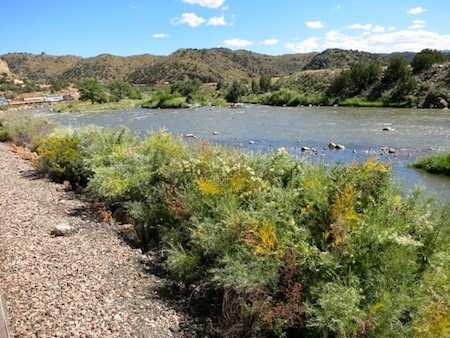 However, we were able to ride on the train for about one hour through the bottom of the Gorge along the Arkansas River rapids and one hour back. The Gorge itself is about a thousand feet deep so the bridge was high overhead. Viewed from the vista-dome diner car and from one of the open cars, the scenery was nothing less than spectacular over the entire journey! We also purchased lunch in the diner car along the way, which was also a real treat! This is fairly easy to do, but not necessarily inexpensive. If you want to switch to DCC, which provides for easier and more realistic operation for two or more trains at one time, the good news is that you don’t have to undo any of the wiring you’ve already done. First replace the DC power pack with a DCC control station (about $200-400) as sold by Digitrax, NCE, MRC, Bachman and other manufacturers. You can find them at your local hobby store or online in a Walthers.com catalog, for example. Just wire the DCC station to the track as indicated in the manual that comes with the device. Then make sure all of your tracks are getting power by turning on all the switches to the track blocks. The basic wiring is done! That’s the easy part. The hard part (or the expensive part) is either converting all your analog locomotives to DCC by installing a decoder in each one, or selling off your analog locomotives and buying all new ones that already have DCC decoders in them. This may be expensive depending on how many locomotives you will need to convert to DCC. 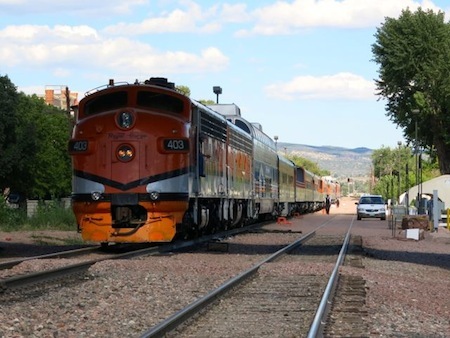 The most inexpensive way to do it would be to install the relatively inexpensive soundless decoders into the locomotives that you already have. This requires time and patience, but rewarding if they work well afterwards, frustrating if they don't. Once you’ve done that, then you can say you’ve converted to DCC. You can add more things to it later as you go along. For example, you will want to have a separate programming track that you can use to program the locomotives with decoders. You need to program the locos with different identifying numbers so that when you punch in the number of that loco into your DCC station, you will be able to control that particular loco. If you try to program any one of your locos while it’s on the mainline, every one of your locos on the layout will be programmed the same way, which you don’t want to do, because then they will all go when you throttle up. If you have a separate programming track, that problem is eliminated. Once again, the instructions for how to do this are in the manual that came with your DCC control station. Later, you may want to control some or all of your turnouts remotely using your DCC station or your handheld DCC throttle that usually comes with a starter DCC set. In this case you will need a separate decoder for each turnout - each of which is programmed with a different number so that you can control each one by punching in its corresponding number into the controller. 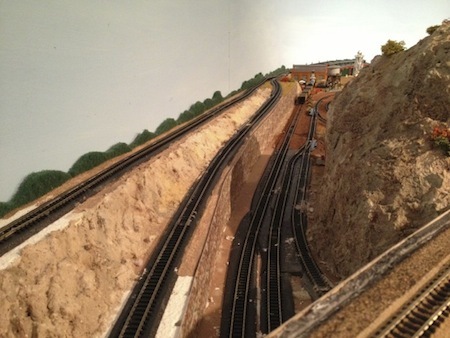 If you have a large layout that you converted from DC to DCC, it may be helpful that you started out with DC, or analog wiring, because if a short, or other electrical failure occurs, you can easily figure out where the problem is by turning off power to various blocks of your layout one at a time and see if the power to other parts of the layout is restored. If the rest of the layout comes alive when a certain block of track is turned off, you know that’s where the problem is. You can use the rolls of paved streets that are sold by Noch and others, although they require some work to make them look realistic. You’ll want to hide the edges of the road with dirt, rocks or plants to prevent that little space between the edge of the road and the surface of the layout from showing. Another method is to draw the road on the layout surface making sure that it’s a little wider than the widths of two automobiles or trucks that will be “using” the road. Then apply a flat layer of Sculptamold to the road surface spreading it as evenly and smoothly as possible between the lines that you’ve drawn. Then apply a layer of spackling compound again smoothing it out as much as possible. Most paved roads are convexly shaped from the middle to the sides so that water will run off them. Your roads should look the same way, but be careful not to overdo this. The convexity should be barely noticeable. Then paint the asphalt with a paint color called “asphalt” (amazingly). Use thin strips of adhesive yellow tape to make the median. Once again incorporate the road into your scenery using dirt, small rocks and/or vegetation along the sides of the road. Don’t forget little details like vehicles, pedestrians, litter, fences, guardrails near cliffs, stop signs, speed signs, etc. The details are what make the scene realistic more than anything else. Woodland Scenics also makes a kit that you can use to make a stretch of road by using form strips along the road edges and filling in the area with a smooth paste. This would probably work best for city streets that are required to be very straight along the edges. The Scultamold method would likely work better for country roads. Dreamplayer is a great way to add sound to your layout fairly easily. You have to purchase the completed circuit-board with a power supply and a removable micro-SD flash card that contains the sound files which can be configured or changed as you wish. You can even create your own sound files, although it reads only .wavfiles. You can start the sound using a motion sensor so that when a train comes by the sound will start, then stop after the train leaves. The sound can even be faded in and out. The audio output is through a 1/8 inch stereo jack that you can connect to any standard powered computer speakers. The device can also be used to activate LEDs, relay switches, to control other devices – not just sound. For example when a train comes by activating a motion sensor, the dreamplayer is activated, which then plays a sound track through powered speakers located under the layout in that area and also, LED lights come on in various buildings, the saw mill starts up and the welding arc light comes on from inside the machine shop! Check out the website (http://www.fantasonics.com/scaledreams/player.html) to learn more. The instructions are detailed and easy to follow. Thank you for your support and for having subscribed to the free BYMRr-Zine, the newsletter for Building Your Model Railroad. http://www.bymrr.com. Even though the newsletter will not be ongoing for now, the website will remain active and will be frequently updated. New techniques, tips and articles will continue to provide the information you need to build a great model railroad!